Restaurante La Barraca is a traditional restaurant offering Spanish cuisine. The average price of a main course dish at the Restaurante La Barraca restaurant is 16 euros. The average price of a 3-course meal at the Restaurante La Barraca restaurant is 37 euros. Note that although GoMadrid.com strives to maintain all information about Restaurante La Barraca up to date, the prices mentioned are only an indication and may not reflect the exact value of your meal. 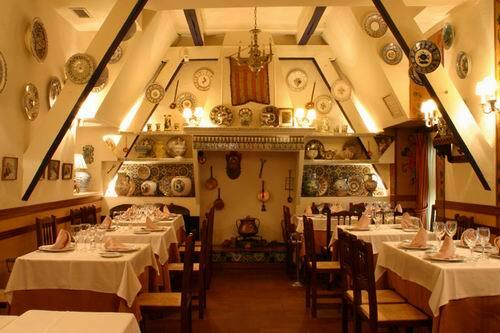 La Barraca restaurant is one of the most famous paella restaurants in Madrid. It was founded in 1935 and is possibly the best of its kind for traditional Valencian rice dishes, as well as Mediterranean cuisine from other Spanish regions. There are more than 10 different types of rice dishes served here: mild or strong, seafood or vegetables, dry or with a more liquid consistency, all are exquisite. The address of the Restaurante La Barraca restaurant is: Calle Reina 29, 28004 Madrid. The nearest Metro station is Gran Vía. Please see the Restaurante La Barraca restaurant location map below.